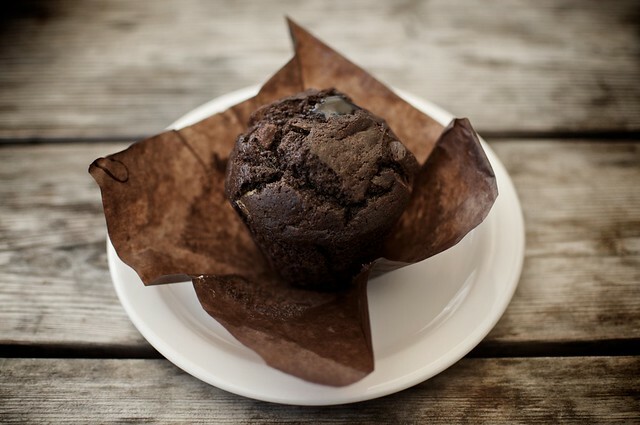 If I’m going to have a chocolate muffin, I want it to taste like good dark chocolate. So I don’t skimp on the cocoa powder when I’m making these, and I don’t go overboard on the sugar. You may be tempted to eat these straight out of the oven, but they taste better after cooling. Enjoy! Mix the dry ingredients (except for chocolate pieces) together in a large bowl. Spoon batter into lined or greased muffin tin. Fill each cup about three-quarters full. Bake at 400°F for 15 minutes, or until the tops are firm. Note: I was having trouble with my camera; hence the Creative Commons photo from Flickr. It’s a good resemblance to the ones I make – I promise! Hello, I've nominated you for a Liebster Award! The nomination page can be seen at http://wp.me/p3Kn9J-bd I hope you'll accept the award and my best wishes for your continued blogging success! Woohoo! Thanks! This looks fun!